Why do you support free access to knowledge? 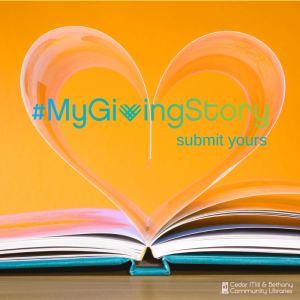 Inspire others and declare the importance of community learning – tell us your “I’m supporting Cedar Mill & Bethany Libraries this Giving Tuesday because …”story! Whether one sentence or one paragraph, your reason for valuing your community library is as unique as you are. Email CMLDevelopment@wccls.org , use the comment section when you donate on CMBCL’s secure website, or visit us on social media and place your story in a comment or message. Please let us know if you prefer your story to remain anonymous.